Reforestation project restores biodiversity and provides fruit for food banks. The Oka Trees of Hope project is returning up to 300 acres of degraded land to a biodiversity rich forest and fruit orchard. The project is near the Oka National Park in Greater Montreal, with land contributed by the Oka Abbey, the municipality of Oka, the municipality of Blainville, and local landowners. The depleted land was largely abandoned agricultural fields and a defunct mine, which have been deforested for over 30 years. At most, the project area had 20% forest cover. The plantings, which began in spring 2014, are a mix of native species to recreate the natural habitat, including predominantly tamarack, white spruce, black spruce, and with smaller numbers of jack pine, red oak and red maple. 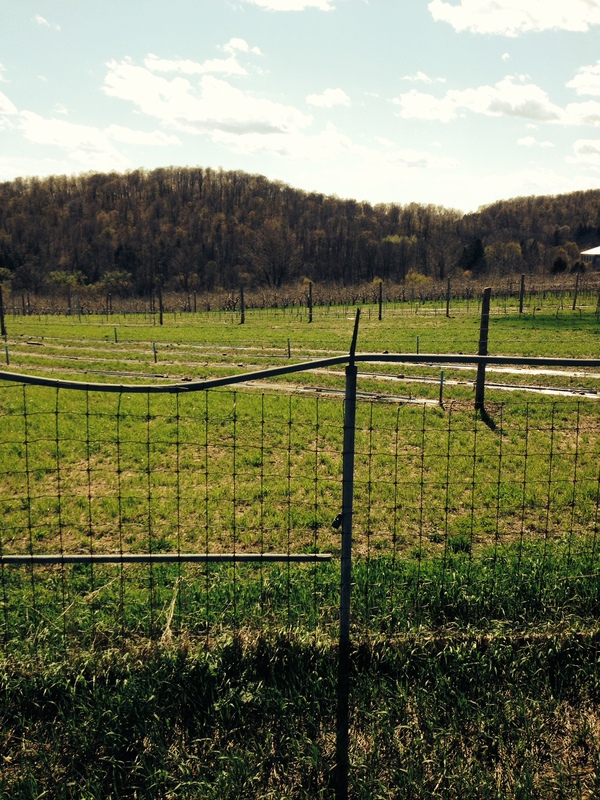 A 10-acre fruit orchard, primarily apples, was planted as part of the Oka Trees for Hope project. The fruit is donated to schools and local food shelves in the greater Montreal region. One such entity is the Moisson Montréal, a non-profit organization and Montreal’s largest food bank. Moisson Montréal serves 206 schools, churches, community centers and other organizations across the Island of Montreal. Collectively, these organizations regularly reach more than 140,000 individuals. CO2 Environment, a Quebec firm with a mission to annually replant about 150 hectares of forest in urban and semi-urban areas is our implementation partner. 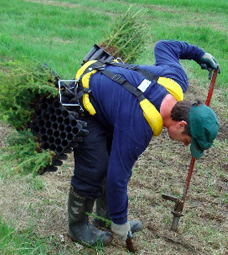 In 2012, C02 Environment developed a similar urban reforestation project in Greater Montreal under the CarbonFix Standard. Partnerships with other apple producers in the region are being developed to increase the overall knowledge base and share expertise. This includes a partnership with the Coopérative Pomicole du Lac-des-Deux-Montagnes. 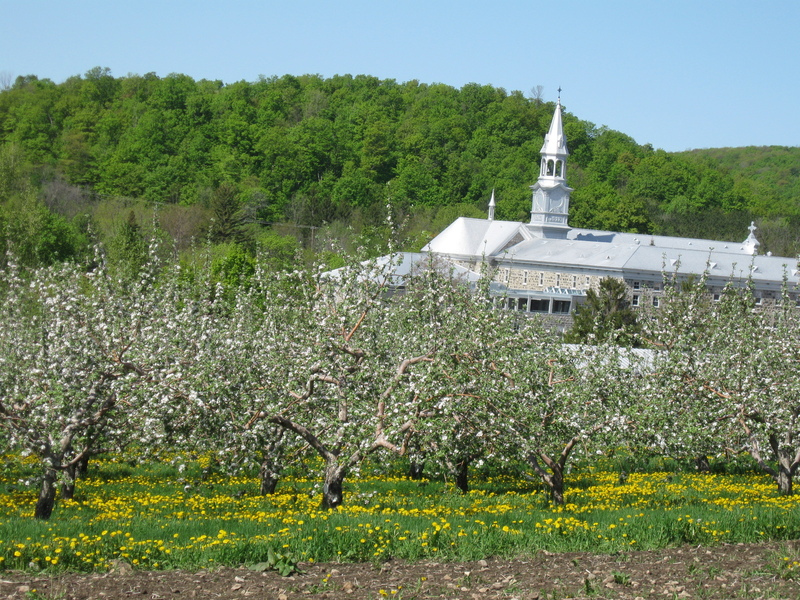 The Quebec apple cooperative, representing 40 producers in the region, provides technical services for operation, maintenance, apple picking and packaging. Le Groupement forestier Maskinongé-Lanaudière, a nearby firm of forestry engineers and project operations managers, was selected to perform field preparation, tree planting and assists at many stages in the project planning and maintenance. They have previously worked on projects with C02 Environment. Reforestation adds to the planet’s net carbon storage and helps moderate global warming by slowing the growth of carbon emissions in the atmosphere. Forty thousand metric tons of carbon dioxide are expected to be sequestered from the trees over the next 50 years. Reforestation of the degraded land also creates biodiversity, enhances wildlife habitat, improves air and water quality, provides soil filtration, controls erosion, and prevents heat islands. The project area was overcome with the invasive weed Phragmites, or common reed, making natural regeneration impossible. The plant was removed and soil was amended to ensure native seedlings could take hold. Most of the fruit production is expected to be distributed by Moisson Montréal and the Club des Petits Déjeuners du Québec5, a non-profit organization that offers nutritious breakfasts in about 300 schools in the province. Total fruit production from 5,000 apple trees will be of about 195,000 pounds per year which translates to nearly 10,000 20-pound bags of apples. Over the first 10 years of the project, we expect 98,000 pounds of apples to be donated to area food shelves. The project aligns well with the Montreal Land Use and Development Plan which has a goal of reversing the trend of forest cover loss and achieving 30% forest cover for the territory. With its proximity to the Oka National Park, the Oka Trees of Hope project improves wildlife corridors and creates additional recreation opportunities. The Oka Trees for Hope project is validated and verified to the Gold Standard. In addition to meeting the stringent requirements of Gold Standard, NativeEnergy has reviewed the project’s finances to ensure that the Oka Trees of Hope project would not have been implemented without the sale of the sequester carbon (i.e. offsets). This means investing in the Oka Trees of Hope project is truly an incremental greenhouse gas reduction.